In 2008, I wrote an article about Hand Protection for ISHN (Industrial Safety & Hygiene News), the foremost industrial safety publication for safety engineers and managers. Surprisingly, not much has changed since I wrote this article so I thought it would be worthwhile to post it here for others looking for this type of information. This way it will be permanently archived as well. 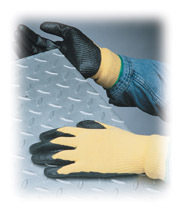 It should be noted that this article is focused on one type of industrial work glove – Coated Gloves – which are the most popular gloves used today in industrial and manufacturing industries. By the way, if you don’t already receive ISHN, I suggest you go to their link at the top of this post and see about subscribing. It’s a good monthly periodical focused on safety products. If anyone has any questions or need any assistance on glove advice, please feel free to contact me.